It all happened rather quickly really. I loved the way the original KFm4 NanoWing performed but knew there would be those out there who can never truly trust an aircraft that doesn’t have a “proper” airfoil. I also wanted to explore whether the performance of the KFm4 version could be replicated with a true symmetrical airfoil or whether there was something going on that allowed the stepped KFm section to carry all that FPV gear in such a tiny wingspan. You might notice that even though this isn’t a KFm4 section it IS still a symmetrical wing. Why build a flying wing with a symmetrical section when just about every other wing out there has a flat bottom section such as the ClarkY or a semi-symmetrical such as the Tsagi or RG15? The answer all comes down to penetration – or at least my dire attempts to beat the continual coastal breeze/howling gale we have here in this part of Australia. Whereas flat bottom sections produce more lift, they are prone to buffeting in windy conditions. This as we all know is difficult to stabilize in a flying wing and we end with the yaw wobbles. Semi-symmetrical sections are better but can be hard to produce accurately using a folded foam construction. Fully symmetrical sections however are designed for speed and manoueverability – two things I wanted in abundance for an FPV race wing! Construction was easy – simply mirror the Flite Test Versa Wing style cut and fold technique on both top and bottom surfaces. The only bit where you have to be (more) careful is when gluing it all together. As long as you ensure the spars line up and the trailing edge of the bottom surface lines up with the elevon hinge line then you should get a nice symmetrical section. TIP! Put hot glue into the cut/crease/fold lines in the front of the wing to strengthen the leading edge. Glue the wing in two stages: First glue at the spar top and bottom and then bring the trailing edges together. 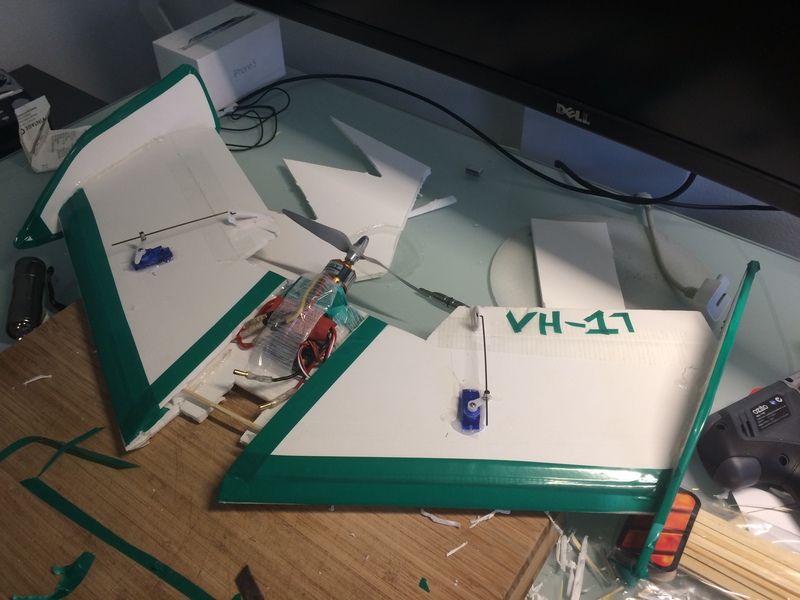 Incidentally, to keep the build neat the tape finish was applied before assembly and all the RC/FPV gear installed into the wing before final assembly as well. I changed the motor mount. The original simply clamped onto the foam wing but this posed two problems now – firstly it would be hard to clamp a curving surface well and secondly I really didn’t like the way the motor bolts were impossible to access and the way the ESC was mounted. The new mount is much more refined and fits into a slot cut in the back of the wing. You retain full access to swap out motors and there is even a tray to mount the ESC with plenty of airflow around it. I extended the winglets a little more backwards. This was purely an experiment to find the sweet spot between form and function. Well, you’ve seen the video already so you know why the smiley face. The Nanowing V2 flies just as well as the original FPV race wing and maybe even a little bit faster. Yes, you do have to watch that stall a little more carefully but are rewarded with a long, smooth glide. It is a sturdy design and looks great in the air. The pod does the trick to mount and protect the LiPo and FPV camera and I found as with the original it balanced perfectly without any added weight. Speaking of weight. I expected this version to be lighter than the original but I was wrong! This wing is actually 20g heavier with an identical electronic and FPV setup. It doesn’t matter in the slightest when it comes to performance but it puts to shame all those comments about KFm wings being heavy! So can I build one of these then…? Be my guest! I’ve drawn up the plans for you to download and build. This will use a single A0 sheet of 5mm foam board. For those who need to know, the plan dimensions are in brackets after the download link. The motor mounts, pods and control horns will be available for purchase through Red20RC in the near future but if you do build one please let me know as I would like to review this later in the year and maybe create a wall of NanoWing build images. Where can I get the stl for 3d printing parts ? There isn’t any 3D printed parts in this wing. The pod and motor mount are CNC cut G10. If you want to modify, you can contac me for the source. Great job btw! THX, Red! Can this be done easily with coroflute? I don’t see why not although my gut feeling is it will be too heavy. You’ll have a high airspeed and it won’t like slowing down! I’m getting there but time is not my friend at the moment! Hi thanks for uploading the plans and sharing the videos. I have just finished building one of these and I was a little confused about a few things. The side wing things – where exactly are the supposed to be attached at the centre line of the side wing or a little lower/higher? Any tips? the spar ends up as three seperate pieces correct? How exactly should the centre panels come together. The winglets are supposed to attach on the center line. It doesn’t really matter as long as they are even on each side. You can even change the shape of them if you want something a little different. The spar is constructed as three pieces. This allows you to build the wing as three panels and then bring them together at the end. Because these wings are so light you can just align the ends of the spars and glue the whole lot together with hot glue. A bit of tape over the joins and it should be strong enough without any other reinforcement. The best way to line everything up is using the trailing edge of all three panels. 2. Your elevons need a bit of reflex. A “proper” flying wing airfoil curves up towards the trailing edge to compensate for the lack of a tail. These foam board wings (and most other RC wings) don’t have that so you need to do it artificially by adding some up elevon. Give them 2-5 degrees of up trim and try again. 3. You are launching at full power. If you are using something like a 2204-2206 mini quad motor the power is insane, even on 3S. Launching at full throttle will just cause it to nose dive. I know this because I destroyed a Foxeer Legend 1 finding out the hard way! Launch at 50-70% throttle and it should be easier to control. Call it Nachowing. You will get lots of hits and it sounds good and easy to remember. I am going to build a Nacho Wing from depron for the 2017 racing season. I also think with the smaller size entry, light weight, speed and maneuverability will bring home the bacon. I might need some guidance as I proceed. Thanks for your putting it all out there for us. Where is the link for the fpv pod and motor mount that shows the pieces of each for assembly? I want to make them from plywood. I plan on sizing it up to 27 inch wing span for small size Wing Racing entry. And, this is 685.8mm as compared to 600 mm original. 114% Nacho Wing for competition. I don’t have the patterns out for the pod at the moment although I do intend to add them to the plan when I get chance. Bear with me a little while as I am just trying to get my life in order and then I will get onto it! Oh, and the 27 inch version should be AWESOME!!! The 27 inch flies fine. Very fast and agile. I am working on a second build of this Nanowing V2. I have 2 new MG servos and a better VTX set up. I’ll use the Emax 2205×2300 KV motor 545 prop, 1300 3 cell and 1300 4 cell battery choice. I plan on flying thru gates low and fast. I have other wings for altitude and distance flying. I also shortened the wing fins and also fixed them with 2/3 above the top of the airfoil and 1/3 below the bottom.of the wing tip.It tracks and surprisingly, the elevons can be trimmed in flight to almost eliminate the reflex and get a wing that flies straight at full throttle. I usually trim my wings to fly with a very slight dive to ensure fast flight. Crazy question, I want to start flying freestyle with my mates who fly quadcopters …. Do you think I could scale down this design to 300mm? Yes! I’ve seen it done with the FT Versa Wing before. I would just swap the foam board for Depron to keep the weight down. Do you mean the plans don’t line up? Make sure when you print the tiled plans you have it set to print at “actual size” rather than fitted to the page. This can sometimes cause a problem. Other problems can come down to printer calibration. Sometimes just a bit of artistic license is needed when sticking them together. Nice wing and nice build can you tell me the thickness of spar that you used on this wing? The spar is 2 sheets thick, so about 10mm and 18mm deep for the full span of the wing. So if i understood correctly all the spar on the wing have the measurments of 10mm width and 18mm hight our the other way arround? I kept it a constant depth across the span for simplicity. You could taper the spars if you wanted to make the wing thinner at the tip. Did you tape over the leading edge to get it to look rounded instead of the step? Yes, that’s exactly what I did! If you have some foam or Depron around you can even glue in thin fillets and sand them to a round section.